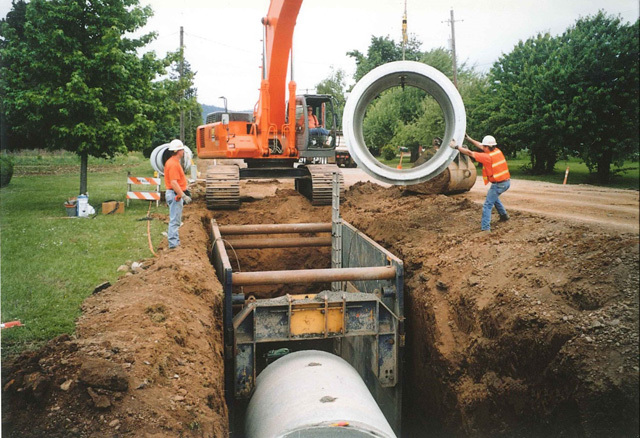 Project Description: Westech designed approximately 4,400 feet of storm drainage improvements for the City of Philomath. Pipe sizes for the project ranged from 42” diameter to 72” diameter. To manage high flows and optimize the existing drainage infrastructure the design included a flow splitting vault configuration at the upstream end of the project. The design also included a railroad bore and a state highway crossing and detailed horizontal and vertical design of large pipe through existing City streets to minimize impact to existing utilities. The Mary’s River discharge structure incorporated a drop manhole well away from the river that reduced pipe depth upstream combined with an oversized discharge pipe with riprap embedded in concrete to dissipate energy before discharging into the river.